This week we returned to the Aquitaine region where we will be spending the rest of our trip through southwestern France. Aquitaine consists of five departments, it’s most renown being the Dordogne more commonly referred to as the Perigord divided into four areas by color — Vert, Blanc, Noir, and Pourpre (green, white, black, and purple). Each area is unique and has its own regional specialties many of which have gained worldwide fame. We began our exploration this week with our stay in Périgueux located in the Perigord Blanc so named for the chalky white color of its soil. This city of 29,000 considered the ‘capital’ of the Perigord first caught our attention on our 2012 trip when we stopped by for a couple of hours on Bastille Day and discovered the many delicious pleasures of its Saturday market. Though we were only here for a short time, we knew we had to return to learn more about it. Earlier this week, we set out to investigate the area north of Périgueux where there are several small towns and villages. 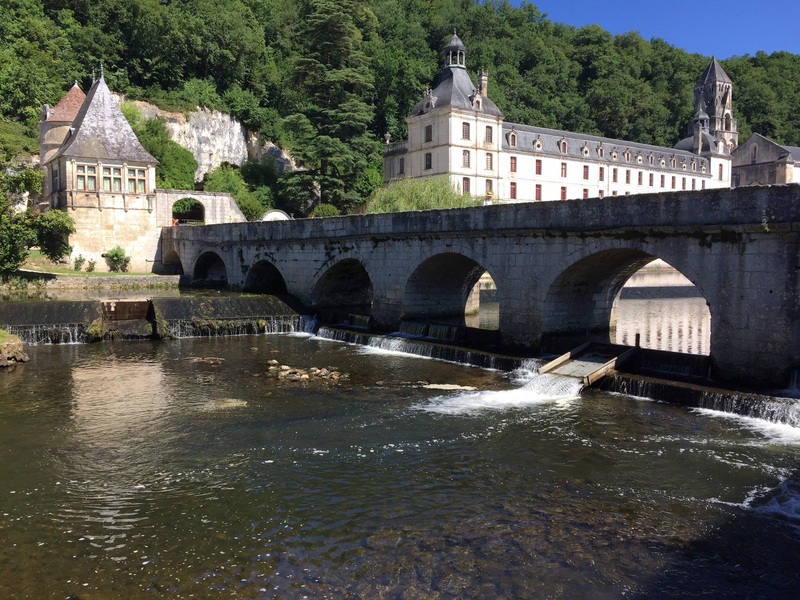 Our first stop was in Brantôme, a lovely town of 2,159 situated in the Perigord Vert so named for the green chestnut and oak forests that dominate the landscape. Brantôme is often referred to as the Venice of France since the Dronne River meanders through this small community and invites a multitude of ways in which to traverse it by water. It certainly lived up to its reputation. Upon our arrival we were immediately greeted with the sights and sounds of the calmly flowing river replete with water lilies and weeping willows. Three bridges cross the river into the central part of town which actually sits on an island by itself. One of the most notable landmarks along the river is the Abbaye Saint Pierre established in 769 by Benedictine monks with the help of Charlemagne, then the King of France. Next to it sits the Church of Saint Pierre parts of which date back to the 15th century. Both imposing structures are impressive. 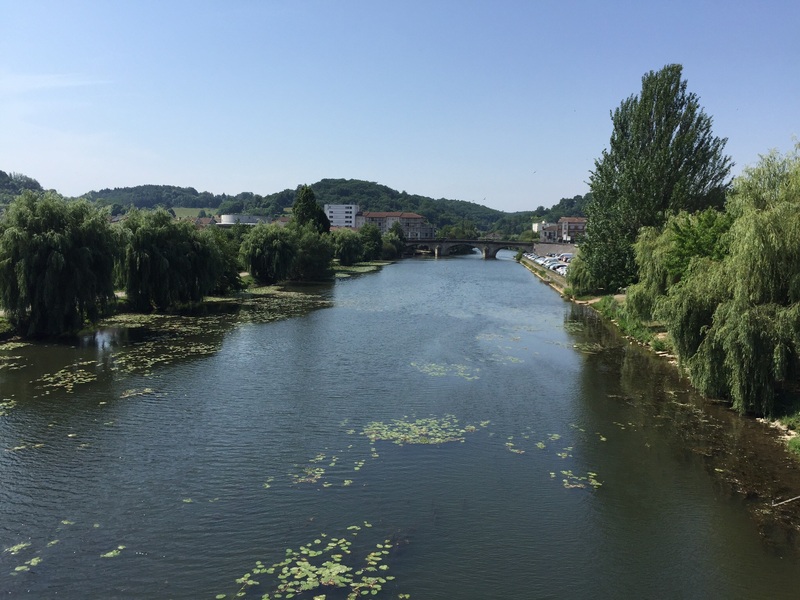 We walked across the arched footbridge to admire the river and its surroundings from various angles and then settled in to the Bar du Marché for some coffee and tea and a bit of much needed shade on a very warm day. Afterwards, we completed our circuit around the town and then set off for Thiviers. One of the most notable and often controversial products of the Perigord is foie gras, a luxury food item made from the specially fattened liver of duck or goose. 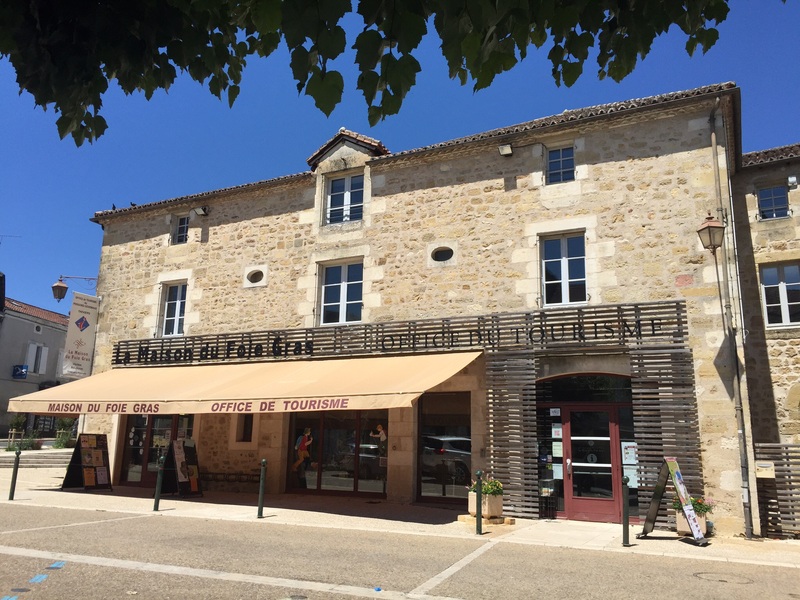 If you are a lover of this gourmet specialty as we are or have ever wondered about it, a visit to the Maison de Foie Gras in Thiviers is a must. This small town of 3,147 inhabitants is the place where Jean-Paul Sartre spent his childhood and where you will find a museum dedicated to the production of foie gras. However, there’s something we learned on our last trip that we forgot to remember. French museums require a lot of time and patience in order to appreciate the wealth of knowledge they provide as just about everything is presented in written format. You have to take your time and read, read, read. Exhibits are short on visuals and multimedia and rarely interactive. Fortunately, we had this small museum all to ourselves this day (perhaps so much of the written word drove others away) and our perseverance in spending the time reading most of the presentations paid off even though we already knew quite a bit. For one thing, we never knew that foie gras was actually created by the Greeks who used dried prunes to feed the geese, the Romans adopted it, and eventually it ended up in France. So the idea is thousands of years old. We learned even more including the interesting fact that the period of time ducks and geese are force fed in order to produce the delectable fattened liver only lasts about two weeks, or 15% of their lives. Once you understand all the details of the process, you realize that these animals are treated far more humanely than most of the poultry we eat in the U.S. We had the feeling that the museum attendants were impressed with how much time we spent there and, of course, they were even happier when we purchased a crock of foie gras with truffles as we left. Speaking of truffles, next stop… the tiny town of Sorges (pop. 1,265) where the Ecomusée de la Truffe is located. 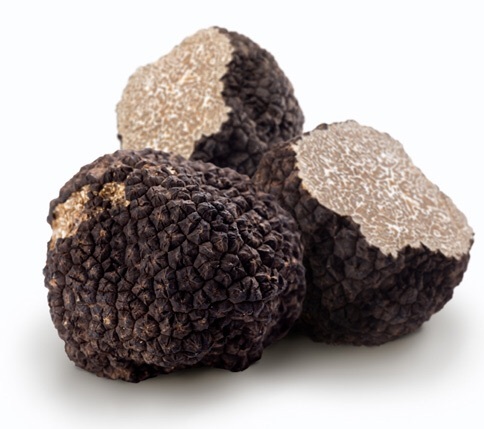 Truffles are the fruiting body of a specific type of fungus and are highly prized in the gourmet food industry sometimes referred to by chefs as “black diamonds”. We had every intention of visiting this museum when we started out in the morning, but after the exhausting task of absorbing all that information about foie gras we could not bring ourselves to face this experience twice in the same day. On top of that, the temperature had risen to almost 100°. There was not a soul in sight for good reason and we quickly decided that the picnic we planned to have there would have to be enjoyed later in the comfort of our much cooler apartment. Besides, we figured the pursuit of truffles would not be nearly as interesting as foie gras. We were fascinated by the landscape we encountered on our short journey. Like many parts of this region, there is a lot of variation. Rolling hills covered with oaks and chestnut trees. Apple, plum and walnut trees and a large amount of deciduous as well as evergreen trees are interspersed among the valleys and ridges of the hills. The roads wind through this bucolic landscape and offer surprising views at every turn. Occasionally, we would cross a slow flowing river spanned by an ancient arched stone bridge or pass between curtains of tall trees lining the narrow roadway. Small villages dot the landscape and there are grand chateaus seemingly everywhere. It’s truly a fairytale setting.